This exquisite Ohm is handcast and hand-finished in solid American Pewter with a shiny finish resembling antiqued sterling silver. 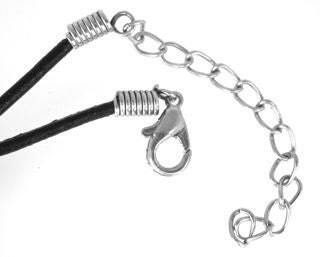 The Ohm is on an 18" genuine leather cord with a lobster claw clasp and 2" extension chain, or you can request one of our additional necklace options below. 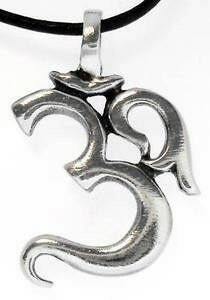 It is made up of three Sanskrit letters, aa, au and ma which, when combined, make the sound Aum or Om and is also called pranava, to mean that it pervades life and runs through our prana or breath. Namaste.